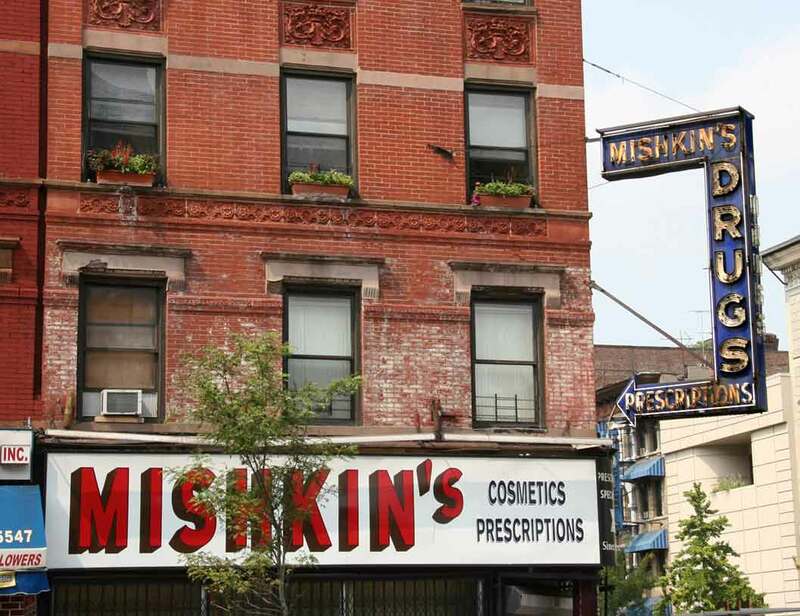 The Mishkin's Drugs at Amsterdam Avenue and 145th Street dates from 1930. Their website includes the following regarding their history, "Mishkin's Drug Store has been a part of the Harlem Community since 1890. ... For the last thirty years, the store has been owned and run by Mr. Seung Yoo who is also the head pharmacist, and his wife Mrs. Yoo-- affectionately called Suzy or Maria by customers.�... In 1890, a Russian Jewish immigrant came to the United States and opened a humble apothecary. It has gone through several owners but for the last thirty years, it has been owned and run by Mr. Seung Yoo and his wife, Mrs. Yoo." This history is a bit skewed. In fact, the Mishkin pharmacies came to Harlem quite a bit later than 1890. New York city directories indicate that the first Mishkin drug store was established in 1897 downtown on the East Side at 214 Rivington St. (corner of Pitt St.). The proprietor of the Mishkin's on Rivington St. was Isaac Mishkin (1873-1966). Isaac Mishkin joined with his brother, Joseph Mishkin (1891-1971), to form Mishkin Bros., druggists, at 538 W. 181st St. in 1914. A few years later, 1916, Isaac Mishkin joined with another brother, Mayer Mishkin (1877-1944), to establish I. & M. Mishkin Pharmacy at 352 West 125th St. This store seems to be the first Mishkin pharmacy in what would usually be termed Harlem. The first Mishkin's on Amsterdam Ave. came in 1925 with a store at 1956 Amsterdam Ave. at 157th St. Then in 1930 the store here at 1714 Amsterdam Ave. was opened. The date 1890 derives from the year Isaac Mishkin emigrated from Russia. His brothers came later, Mayer in 1892, and Joseph in 1907. Isaac Mishkin's naturalization petition, 1898, states that he was born 12 March 1873 and that he arrived in New York 15 June 1890. Mayer Mishkin's naturalization petition, 1902, states that he was born 10 September 1877 and that he arrived in New York 7 July 1892. Joseph Mishkin registered for the World War II draft in 1942 when he said that he was born August 1891 in Russia, and that he was employed at 1714 Amsterdam Ave., New York. It was Isaac Mishkin and Joseph Mishkin who were proprietors of the drug stores at 1714 Amsterdam Ave. and 1956 Amsterdam Ave. The store at 1956 Amsterdam Ave. seems to have closed in the mid-1970s. 1714 Amsterdam Ave. was still going strong as of June 2015. Thomas E. Rinaldi, New York Neon, 2013, has the following on the Mishkin neon sign, "Mishkin's dates its origins to 1890. The neon sign has anchored this corner for about half that time." Tom is saying, then, that the sign was 61 years old in 2013, which means it dates from 1952.